Simply Southern Girl: Egg-cellent Easter idea- Egg Bread!! 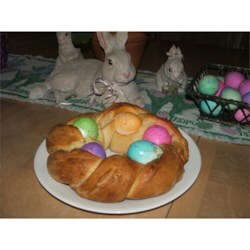 Egg-cellent Easter idea- Egg Bread!! The below bread is one of my favorite Easter Memories. "Egg Bread" is somewhat of an Easter tradition in the Dwyre household. It combines my love of baking with traditional egg dying event. Mom and I made would make several batches of this bread each spring. Not only does "Egg Bread" make an "egg-cellent" and vibrant addition to your Easter spread, it is makes for a great gift, or donation to a charity auction. In a large mixing bowl, combine 2 cups flour, sugar, yeast, cardamom and salt. In a saucepan, heat milk and butter to 120 degrees F-130 degrees F. Add to dry ingredients; beat just until moistened. Add 3 eggs; beat until smooth. Stir in enough remaining flour to form a soft dough. Dye hard-cooked eggs; lightly rub with oil. Punch dough down. Turn onto a lightly floured surface; divide dough into thirds. Shape each portion into a 24-in. rope. Place ropes on a greased baking sheet and braid; bring ends together to form a ring. Pinch ends to seal. Gently separate braided ropes and tuck dyed eggs into openings. Cover and let rise until doubled, about 20 minutes. Beat water and remaining egg; gently brush over dough. Bake at 375 degrees F for 28-32 or until golden brown. Remove from pan to a wire rack to cool. Refrigerate leftovers. I'll be sure to post pictures of the progress of this year "egg-bread" the week of Easter, when Chris and I embark on the adventure together! Good news is I have a new shiny red Kitchen Aid to aid in the task.